Last night as we sat in our livingroom watching the Colorado Rockies and working on a few new listings we heard little bits of hail begin to pig off our house. A few minutes later the pings grew into a roar of ping pong ball sized hail. We made our way from the living room to the front windows to watch the storm. As we did, the television broke into a severe storm warning... thanks for the heads up! 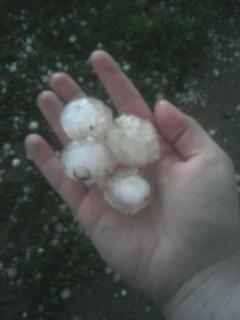 By the time it was all said and done we had about 2 inches of large hail on the ground and a widow well full of water! The water was gushing inside our basement windows and threatening our new carpet. Thanks to some great friends, family, and neighbors we were able to get it under control. We are so fortunate to live in the community of Gillette which is like a big family of its own. We will be interested to see the extent of the damage to the new buildings in our area like Gillette College and the new $52 million rec center. No matter what the damage total is, this community will come together to help one another...because that's what a family does. Interest Rates are on Their Way Back Down in Gillette WY!